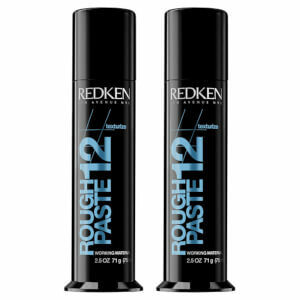 Redken Styling - Rough Paste will create ragged texture and moveable separation, allowing you to switch up your style as much as you like throughout the day. Designed to stay completely pliable, this medium control paste will allow you to add strong definition to your hair. - L.M. Have used this product for several years now. I get the definition needed for my hairstyle, the flexibility of the product that makes my hair look naturally styled. No wastage unlike some other products therefore excellent value for money. Brought this with extra discount, great price b4.. Works well to give sculpture to hair. Would recommend. This is lovely. When you have finished styling your hair you just need a very small amount, rub with both hands and claw it through your hair. Superb online service - user friendly website, fantastic prices will be shopping here for my hair product, and recommending the site to my friends and family. I gave this 5***** as it is the best rough paste I have used ,and lookfantastic is a great web site . Love this product, (not sure why it has rough in the name though?) fantastic hold without making you hair feel like a helmet. Unbeatable price from Lookfantastic makes it a must buy. Fabulous product. I've been using it for a few years and while I do try other products I always come back to it as it is easy to work with, washes out easily (leaving no residue) and I know that my style will last all day. I've been using Rough Paste for over 5 years now, it is a great product with good hold as long as it's not too windy! Great for "bed hair" styling for guys. I would recommend this rough paste to anyone.my hair is so fine an some products would break it,if to heavy,this was amazing,i will always buy it.an thank to lookfantastic for there quick delivery.i always use them,as theres never any hassle with them.thanks again look fantastic.